Free Printable California Commercial Lease Agreement is used when leasing a commercial property in California. This agreement is in accordance to the California. Civ. Code §§ 1925 to 1954.1; 1961 to 1995.340 and both the tenant and the landlord must abide with the laws. Name of the lessor and tenant along with the city in which the property is located and address. The term of this agreement in years, the date of commencement and termination, the amount of rent to be paid every year in dollars. The purpose of use of the property etc. If the tenant does not default in the performance of this lease, then both the parties can mutually agree to renew the lease for the said property. The tenant will occupy the property only for the commercial purpose stated in this agreement and for no other purpose. If the lessor and/or tenant is a participating member of the US small business Administration 504 loan program then the lease will be construed in compliance with the requirements of the program according to those found in Title 13 of the Court of Federal regulations, the SBA standard operating procedures 50 – 10 and other relevant statuettes laws, codes, regulations and procedures. The tenant agrees to maintain the property in good order and repair and he shall at his own expense maintain the property which includes plate glass, electrical wiring, plumbing and heating installation and any other system or equipment. The tenant will not make any changes, alterations, additions or improvements to the property without prior written consent of the lessee. The tenant will comply with all statutes, ordinances, regulations, covenants, conditions and requirements of all municipal, state and federal laws. The tenant will not assign this lease or sublet any portion of the property to any other party without prior written consent of the lessee. The tenant will let the lessor or the lessor’s agents enter and inspect the property at reasonable times upon reasonable notice from the lessor. If the delivery of possession of the said property is delayed by the lessor, the lessor will not be liable for any damages caused thereby. The tenant is not liable to pay rent until he is delivered possession of the said property. The tenant will indemnify the lessor from any damage or injury to the tenant according on the property and holds the lessor harmless from any claims for damages on the said property. The tenant at his expense will maintain plate glass and public liability insurance with minimum coverage. 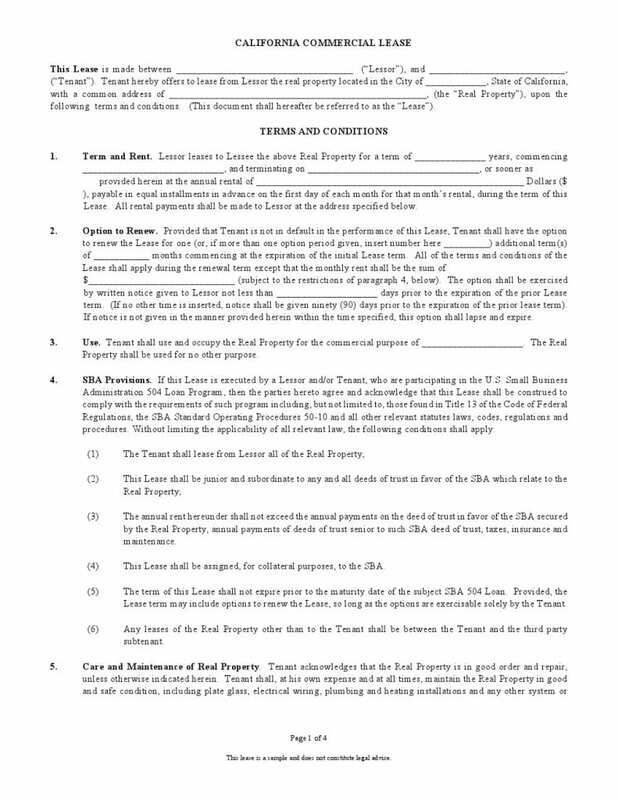 The rest of this template contains clauses dealing with destruction of the property and any defaults caused by the tenant and the lessor’s remedies for those defaults, the Security deposit that the tenant has to deposit with the lessor for the term of this agreement, common area expenses, attorney fees, waivers, notices, Heirs, assigns, and successors etc.